Sadly we don’t have a great aperitif tradition in the UK. On the rest of our fine continent, though, it’s a different story. 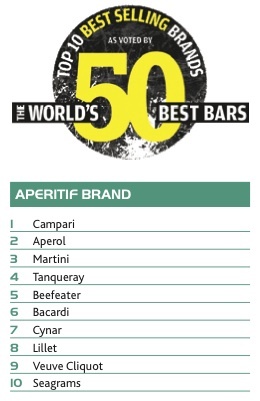 The Italians enjoy a little snifter to prepare themselves for food so it’s no surprise to see the likes of Campari, Aperol and Martini in the best-sellers. Then there are the gins – the champion spirit of the aperitif cocktail. Think Martinis, Vespers and Negronis. 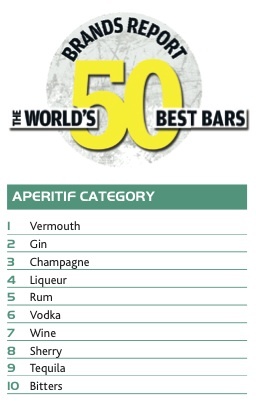 It’s good to see a champagne brand on there though we always associate Veuve with rich brioche and biscuity notes. We expected to see an apple-fresh sparkler on the list, one that perhaps hasn’t undergone malolactic fermentation and therefore still contains some of those malo (Latin for apple) characteristics.